DSME and Kongsberg Maritime have signed a Joint Development Agreement (JDA) for a new LNG FSRU regasification control system. As part of the delivery scope for a vessel currently under construction at the Okpo shipyard in South Korea, DSME will develop a High Fidelity Dynamic Simulator for the regasification plant. The JDA, which was signed on 29th November 2016, enables DSME to utilise Kongsberg Maritime’s Dynamic Process Simulator “K-Spice” and the “K-Chief” automation and control system for the joint development of the vessel’s regasification control system. Both parties have extensive experience in the field of LNG vessel control systems. DSME is fast approaching delivery of 100 LNG ships, many of them operating with Kongsberg Maritime’s LNG control system on board. In total Kongsberg Maritime’s rapidly expanding LNG vessel reference list now surpasses 200 LNG control system installations. During the company’s long-standing partnership in the LNG business, several different concepts for gas handling have been developed. Simulation studies are today established as increasingly important in this field of development, to ensure robust design and to verify design parameters. 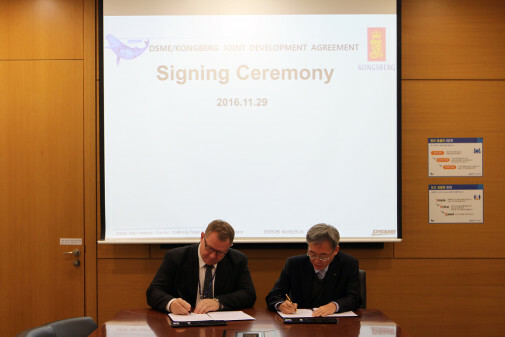 Further to the signing of the JDA, DSME and Kongsberg Maritime are in further discussions for possible cooperation on marketing activities of the new LNG FSRU regasification control system.